Hooray! I finally have both blooms to show and the wherewithal to post on the 15th of a month for Garden Bloggers' Bloom Day, hosted by Carol at May Dreams Gardens. So say hello to my African violet, who's greeting you in blooms and who is the only living plant inside or outside my house in bloom. I've gotten at least half a dozen of them from people who couldn't get them to bloom, handed over in part disgust and part challenge ("You're a master gardener, see if you can get it to bloom"). Despite not being that attentive to house plants, and doing nothing special with the African violets, they do bloom. 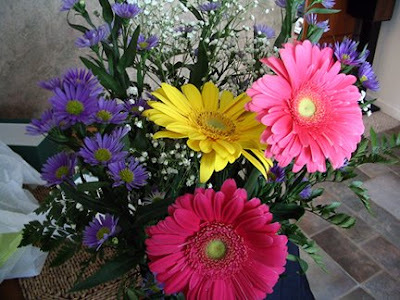 Moving on to real blooms of non-living flowers, here is a nice colorful bouquet I got at my leaving do at work. Next we have an almost-bloom. I got this amaryllis on sale after Christmas (OK, hands up anyone who doesn't yet know I'm cheap! ), and it's almost ready to bloom. I just love the red lines on the bud! 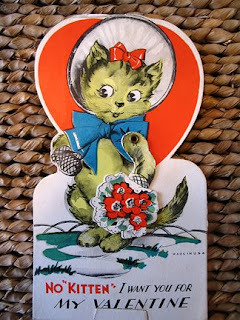 Moving on to fake flowers, look at the nice bouquet on this retro Valentine my friend Aunita sent me. I love, love, love older Valentines. And check it out, the kitten is actually wearing mittens! And now some plastic flowers in this cute Playmobil set my friend Julia got me. It's a garden faerie, just like me! Note the wings are removable, which is handy as it does get tiring lugging them around when working in the garden. Note also that the wheelbarrow is shaped like a leaf. There's enough detail in the pruners (though they don't open) to tell they're bypass, not anvil! And the rabbits are just darling (thank goodness they're not groundhogs!). Fiona (who's 8 pounds on a good day) wants to give you a size reference (everybody, say "Thanks, Fiona!"). Well, that's all that's blooming here at Garden Faerie's Musings. Cheers! Everyone needs a garden fairy. I didn'y even think of showing my African Violet. It's been blooming for a couple of years now, so I suppose it's kinda faded into the back of my mind! 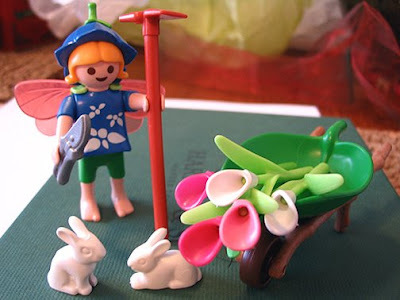 Great photos - and I love the playmobil faerie gardener! Good luck with your new career - I'm right behind you in your choice to do it! I used to have tons of African violets when I was a kid, but swore off house plants about 20 years ago. Little by little I find more plants creeping into the house, especially since I started overwintering tender garden plants indoors. It would be fun to add an African violet or two (or ten) to the mix. I've been sorely tempted a few times now after seeing pics of them on other blogs. They are such nostalgic plants for me. . . make me feel all warm and fuzzy! Your post made me smile Monica. My mum grows African violets to perfection. She has a row of different coloured ones on a window sill. I have lost count of the number of little plantlets that she has rooted for me, and that I have succeeded in killing :( Mind you I don't have much joy with houseplants. That sweet little garden faerie looks most industrious, and Fiona looks like an absolute giant beside her. How cute !!! Love every bloom, Monica!!! I love african violets...isn't your kitty eating yours? Mine did! 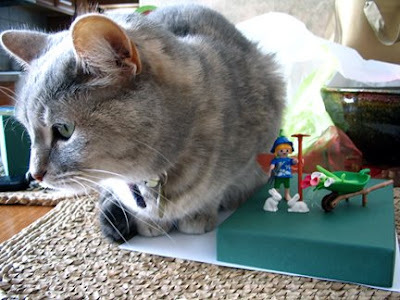 I love your garden fairie mascot, too:) It IS tiny!!! My favorite bloom is Fiona!! (I also like your floral arrangement, given to you...). Hope things are going well for you. Isn't it nice how sometimes things come together, like you having blooms and joining us for bloom day! I also love that little garden fairy! Monica this was a delight view of your blooms! I'd say that Spring is in the air at your fairy house..Fiona is a wee girl at 8lbs..mine are 14 and 13 lbs. Your little fairy is adorable! I think it's nice to have "amaryllis"
blooming after Christmas because there is so much color with the decorations and NOW is the time we need a hit of flower power! I want that Playmobil set! I've never seen it, although my daughter isn't into Playmobil. My son has the pirates and the knights. I must learn the secrets of getting/keeping the African Violets in bloom. I'm dipping my toe in the water, so to speak, with a very small one. The garden fairy sounds so sweet. I, too, love to have a blooming violet or two in the house. 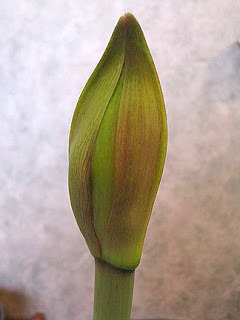 I also like to find a good deal on plants and think your Amaryllis bud is gorgeous! I feel so good when I can revive a plant that was destined to be tossed out by the retailer. Thanks for visiting the 'Artists in the garden'interviews. Now I've seen YOUR African Violet! I'm hoping my Clara is growing roots. :-) And, how are you doing now? I've re-read your previous post. A lot of history, and a lot of growth. I'm excited for you, here. Keep us posted and I will look for your gardening book before long! :-) And then Everyone will want their picture taken with you!! I love your little garden faerie! And Fiona is a charmer! She is a gorgeous cat. Monica: I am back again to let you know that I will be going to "the Desert Botanical gardens" once again this year while in Scottsdale! Just click on the label box below the posts and you'll view all that I shared last year. Yes I'm a snow bird in the winter..love to fly to warmer climate..and besides my son lives there! James, I just checked your polka dots! They are furry cute!!! I really like your cat. I'm totally there with you in buying plants after Christmas when they are deeply discounted. I'm glad I saw the scale of the wheelbarrow before I went looking to buy one. I only wish I had the skill to make a life size one. The leaf shape is too cute. Monica the Garden Faerie on the other hand is a bit scary waving a chain saw around. I wouldn't dare disturb her garden. 'Ground Hog' takes on a whole new meaning for me now. Love that Violet, I've been growing them for years no problem. In the 50's my Mom actually raised them under lights in our basement in Rochester NY. Feel like I've been growing them all my life!! 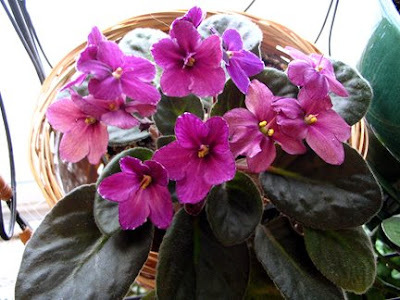 Wow, a lovely African Violet it is too. Well done. What wonderful presents and cards you have received. I love things in miniature, especially the wheelbarrow etc. Tiny secateurs, how fabulous.